2. Altman DG. The scandal of poor medical research. BMJ 1994;308:283-4. 3. 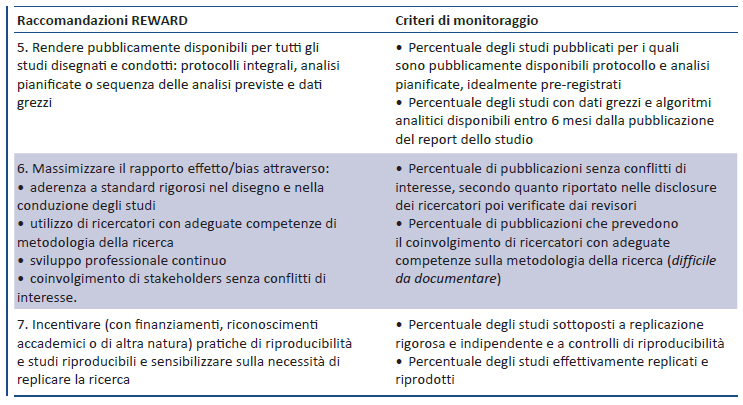 Chalmers I, Glasziou P. Avoidable waste in the production and reporting of research evidence. Lancet 2009;374: 86–89. 4. Goldacre B. Bad pharma: how drug companies mislead doctors and harm patients. London: Fourth Estate, 2012. 5. AllTrials. Disponibile a: www.alltrials.net. Ultimo accesso: 27 maggio 2016. 7. Macleod MR, Michie S, Roberts I, et al. 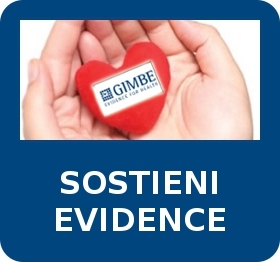 Biomedical research: increasing value, reducing waste. Lancet 2014;383:101-4. 8. Chalmers I, Bracken MB, Djulbegovic B, et al. 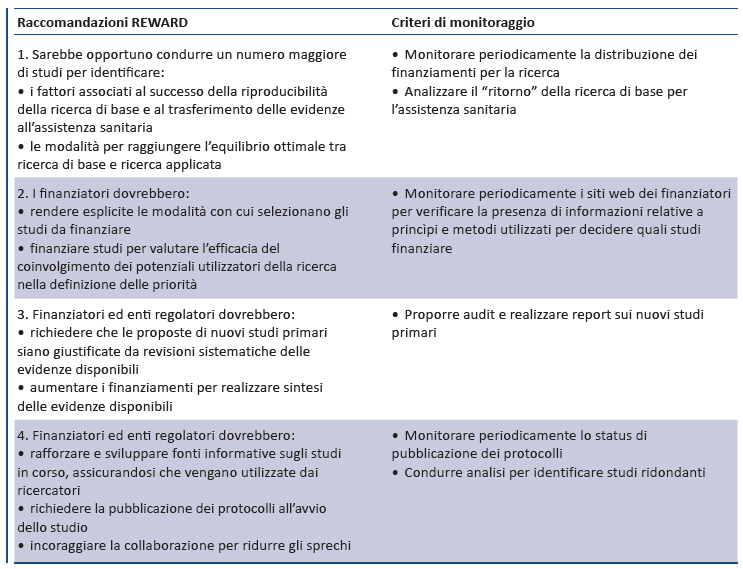 How to increase value and reduce waste when research priorities are set. Lancet 2014;383:156-165. 9. Ioannidis JPA, Greenland S, Hlatky MA, et al. Increasing value and reducing waste in research design, conduct, and analysis. Lancet 2014;383:166-75. 10. Al-Shahi Salman R, Beller E, Kagan J, et al. 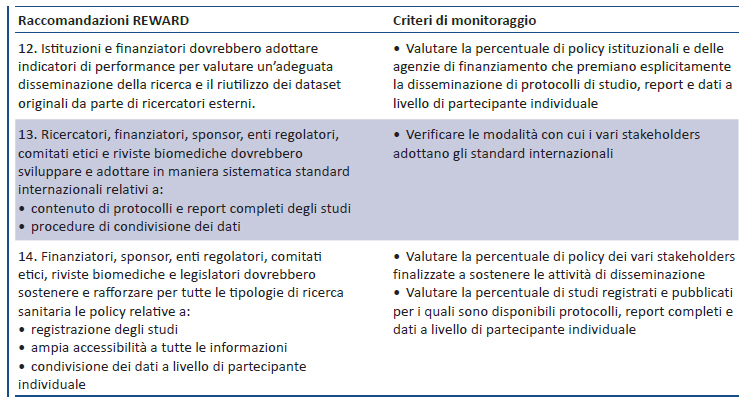 Increasing value and reducing waste in biomedical research regulation and management. Lancet 2014;383:176-85. 11. Chan A-W, Song F, Vickers A, et al. Increasing value and reducing waste: addressing inaccessible research. Lancet 2014;383:257-66. 12. Glasziou P, Altman DG, Bossuyt P, et al. Reducing waste from incomplete or unusable reports of biomedical research. Lancet 2014;267-276. 13. REWARD Alliance. Disponibile a: http://rewardalliance.net. Ultimo accesso: 27 maggio 2016. 14. 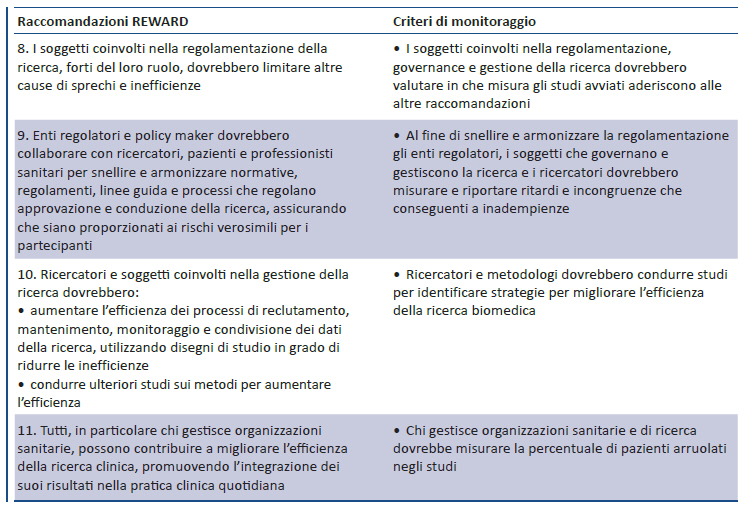 Lancet REWARD (REduce research Waste And Reward Diligence) Campaign. Disponibile a: www.thelancet.com/campaigns/efficiency. Ultimo accesso: 27 maggio 2016. 15. Moher D, Glasziou P, Chalmers I, et a. Increasing value and reducing waste in biomedical research: who’s listening? Lancet 2016;387:1573-86. 16. Kleinert S, Horton R. How should medical science change? Lancet 2014;383:197-8.